The Southeast Asian Ministers of Education Organization (SEAMEO) and the Government of Canada awarded the winning research of the 2012 SEAMEO-Jasper Research Award in a ceremony held during the 47th SEAMEO Council Conference on 19 March 2013 in Hanoi, Vietnam. The award was bestowed to the research of Mr Nantha Kumar Subramaniam of the Open University Malaysia called “Web-based Instruction for Adult Learners: An Asynchronous-based Delivery Model for Formal Lifelong Learning”. Twenty research entries contended for the 2012 award cycle which was themed “Lifelong Learning in Southeast Asia”. 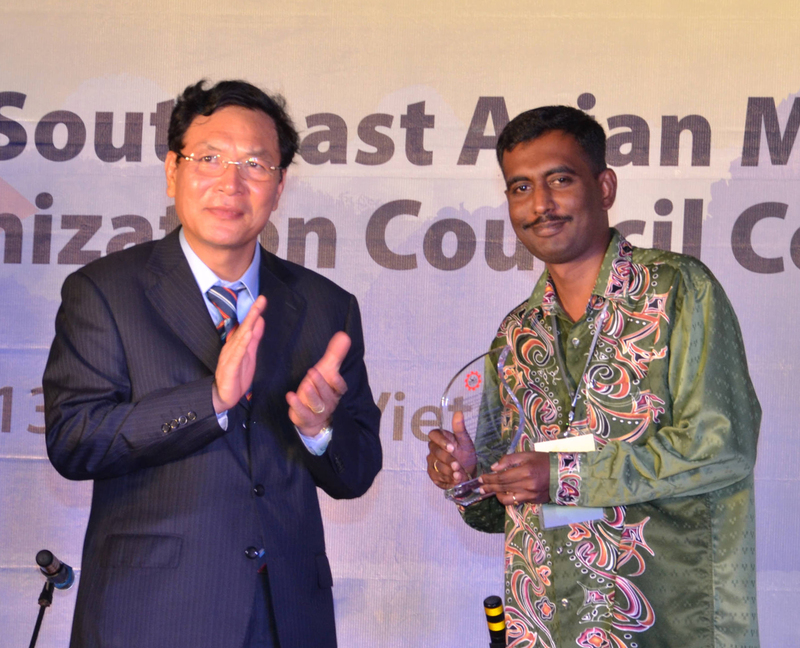 During the awarding ceremony, the plaque of recognition was awarded to Mr Nantha Kumar Subramaniam by His Excellency Pham Vu Luan, President of SEAMEO Council and Minister of Education and Training, Vietnam. The winner would also receive a travel fellowship to Canada to disseminate results of the wining research to relevant research institutions in Canada. Her Excellency Deborah Chatsis, Ambassador of Canada to Vietnam presented a speech on the SEAMEO-Jasper Research Award, and announced the winner. SEAMEO-Jasper Research Award is a yearly SEAMEO award that aims to encourage young scholars to conduct researches on a theme on social development in Southeast Asia. It also facilitates continued interaction and knowledge-sharing among Southeast Asian and Canadian researchers. His Excellency Pham Vu Luan, President of SEAMEO Council and Minister of Education and Training, Vietnam; Her Excellency Deborah Chatsis, Ambassador of Canada to Vietnam; and Dr Witaya Jeradechakul, Director, SEAMEO Secretariat applaud as the winner of the 2012 SEAMEO-Jasper Research Award receives the plaque of recognition. Her Excellency Deborah Chatsis, Ambassador of Canada to Vietnam announces the winner of the 2012 SEAMEO-Jasper Research Award. The author of the winning research is Mr Nantha Kumar Subramaniam of the Open University Malaysia (OUM), Malaysia. The winner of the SEAMEO-Jasper Research Award 2012 will receive the Plaque of Recognition at the Awarding Ceremony scheduled on 20 March 2013 during the 47th SEAMEO Council Conference in Hanoi, Vietnam, 19-21 March 2013. High appreciation is extended to all researchers who participated in the 2012 SEAMEO-Jasper Research Award. Appreciation is also extended to the Ministries of Education of Southeast Asian countries, SEAMEO Regional Centres and SEAMEO partners for their assistance in the promotion and information dissemination of the 2012 SEAMEO-Jasper Research Award. The Theme for the 2012 SEAMEO-Jasper Research Award is Lifelong Learning in Southeast Asia. This year's theme is in response to the growing significance of and demand for lifelong learning in Southeast Asia region and beyond. The theme aims to explore the variety of perspectives and practices of Southeast Asian countries in promoting, supporting and improving lifelong learning given the diversity of their economic, political and socio-cultural settings.